Growing up, homemade at my house was made from Wick Fowler Chili packages. You may be able to make this chili at home without the package. If you have never tried one of the Wick Fowler 2 Alarm Chili packages sold in most spice sections of the grocery stores you are missing out on some easy to make chili. They have an optional red chili packet inside of there so you can dial up the heat to the chili if you desire. We always went all in, living in Texas I think our levels of heat are different than in some parts of the country. 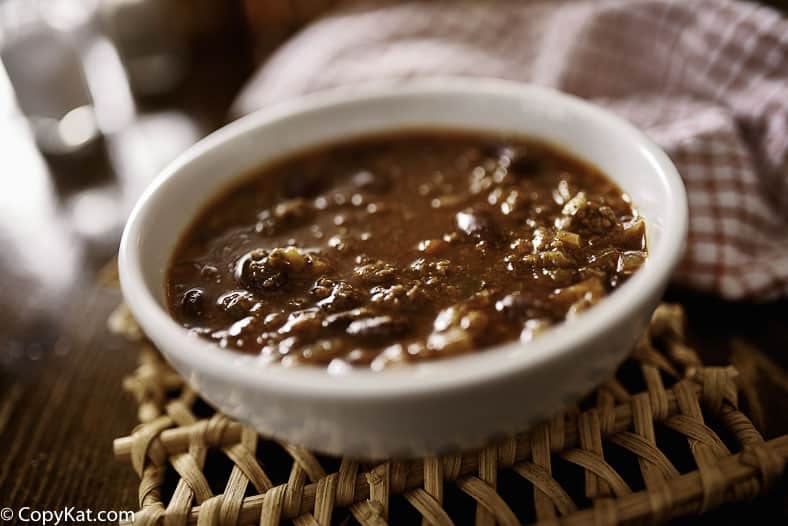 Let me say, that the Wick Fowler packages are handy, and they make putting together a family-sized batch of chili together in no time so easy. Maybe your spice cabinet is already full, why not use what you already have on hand? These packages of chili mix are sold in the grocery store, they run just under 3 dollars. They portion the spices out for your perfectly. I am a big believer in using what you have on hand, instead of buying pre-made packages if you can avoid it. The spice base of this recipe contains paprika, masa, dehydrated onion and garlic, salt, cumin, oregano, cayenne, and chili powder. Chances are you already have the paprika, salt, cumin, oregano, and chili powder on hand. You can use fresh onion and garlic if desired. You may want to purchase some masa. The masa will thicken the chili if desired. You could leave it out as well, it depends on how thick you like your chili. In the box of spices, you will find a packet labeled “red pepper”, we are substituting cayenne for the red pepper. Cayenne is a type of red pepper. While it is controversial for some, I always add beans to my chili. I know many fine people who are against adding beans to chili, and that’s ok. I have added red kidney beans to the batch pictured here, but pinto beans, or even canned chili beans all work well. 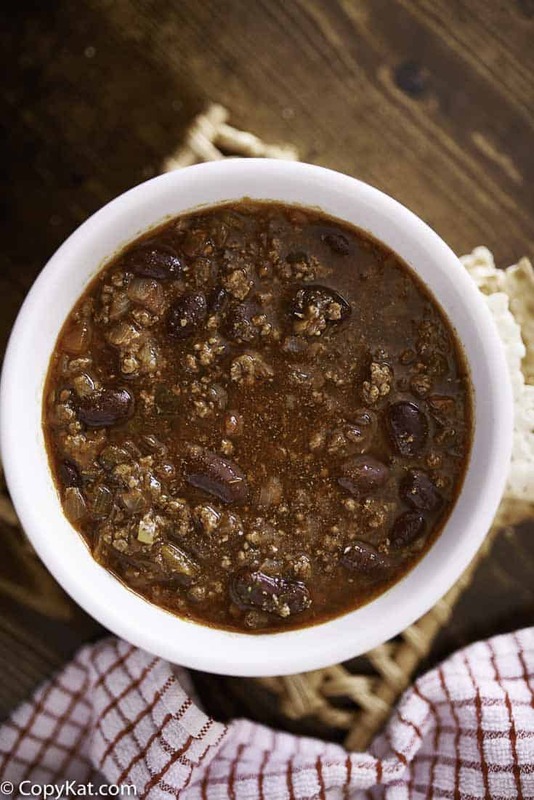 You can make this chili in about 30 minutes, it does taste better the second day, and it is perfect to warm up on a cold day, or brown bag it at work. What makes this recipe unique is that you control the heat with the cayenne pepper, if you don’t like your chili too spicy, don’t add the cayenne pepper at all. If you like it a little spicy, add half of the cayenne pepper, and if you want it spicier add all of the cayenne pepper. Here are a few ideas on how to change this recipe. Instead of adding water, add tomato juice, the tomato juice can really intensify the flavor of the chili. Add 1/2 to 1 teaspoon of Chipotle powder. Chipotle powder is made from smoked jalapenos, chipotle powder adds lots of smoke without adding a lot of heat. Swap the paprika for smoked paprika, add a nice bit of smoke to the chili. Use a coarse grind of beef, ground brisket is amazing. You can make Wick Fowler 2 Alarm chili without the package of spices. Brown the beef in a large pot or dutch oven. Drain beef. Add the spices (with the exception of the masa) and stir in thoroughly. Add tomato sauce and water. If desired add 1 14 ounce can of beans. Reduce temperature to simmer. Simmer for about 30 minutes. If you want to thicken the chili, mix the masa in a 1/4 cup of hot water. Stir the masa until smooth. Pour the masa mixture into the chili. Cook until the chili thickens and serve. I’m in a quandary in that the recipe calls for “chili powder” and, in my experience there are considerable differences (in my opinion) between brands of chili powders. Do you have any particular brands that are preferred? I personally use Penzey’s or The Spice House chili powders for personal use. For recipe development, I use McCormick. Thanks for the information…… I use some Penzey’s spices but have never used their chili powder. Hi, Chris. Just thought I’d chime in. I agree with Stephanie on the McCormick chili powder. It is an excellent product as are all of their spices, and I always keep a restaurant size container in my kitchen. My personal favorite and what I consider one of the greatest chili powders is Mexene. It has become somewhat difficult to find in my area though, even though it was created in Texas. My grandmother always used Mexene. It’s been used in a lot of award winning chili recipes. I have used Mexene as well. It’s great chili powder. I get my Mexene chili powder from Kroger. A co-worker told me how much she loved it. I always add 1 can of RoTel diced tomatoes with chiles to the pot along with the 8 oz can of tomato sauce. This replaces some of the water used and gives it some extra flavor. I also dice a medium onion and cook it with the ground beef for extra flavor. Chili is something that you can improvise on until the cow come home and it always tastes good. I added a half of a cup of beer to this recipe and won the office chili contest. I was pretty excited about that. Made this chili for my Mom. She got gas while we were at the movies. She is lucky to have silent by deadly farts. My add-ons for Fowlers is to drop the salt considerably (no-salt tomato sauce, and cut the salt packet in half), but some of that comes back because i add Worcestershire sauce to the beef as i’m cooking it, then more in the mix itself, along with extra garlic. oh, and half a bottle of beer (I drink the other half). I add beans too, just to help make it last. i also crock-pot it over 6 hours which helps get that ‘powder’ texture out of it. I keep meaning to try adding beer to chili, I just never think of it. Thank you for the great chili recipe. I used Wick Fowler’s for a long time. Then I decided, why not use ingredients I have, just as you said. I would like to mention a few alterations I made for your viewers. I like my chili thick, but also full of flavor so I build it from the start with that in mind. First, I don’t drain the fat, I’ll go on a diet tomorrow. Next I add the spices using minced garlic and fresh onion instead of powdered and dried. Next I use one can of Rotel ‘HOT’, undrained, one 8 oz can tomato sauce and simmer on low, cooking down the moisture until thick. Then, and here’s the big difference, instead of using water I use 8 oz of a good mexican beer such as Corona. Then cover and simmer until thick as long as it takes. Thank you for allowing me to share and as always I love your recipes. Also, I don’t use the masa as it tends to diminish the flavor. Making thick from the start negates the need. I also use beans, canned chili beans but I drain and rinse them before adding them as the last ingredient. How much oregano???? You left it out. I have swapped one of the cans of water for another can of tomato paste. I love your idea of using Manwich sauce. I will have to try that sometime when make chili again. Are you saying a total of 4 lbs or it that a typo? Chili in winter time is one of my family’s favorites! I can’t wait to try this!